The demands made on today’s flooring are as diverse as the lifestyles and interior designs they support. While there are as many reasons for the rapidly increasing popularity of laminate flooring as there are styles, the end result is always the same: satisfying even the highest demands for comfort, functionality and beauty. 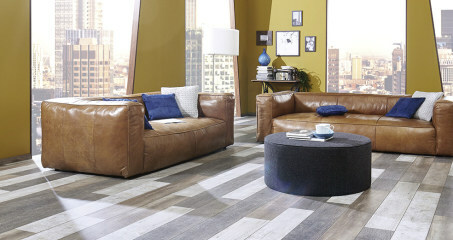 Nowhere is this more true than in the extensive EURO HOME line of high quality and exclusive laminate flooring. Whether in a plank, strip or tile look, precision aligned or randomly staggered, the inspired matte surfaces of EURO HOME laminate flooring with glistening wood pores are designed to exquisitely exceed all needs and expectations, no matter the style. Incorporating numerous technical advances, EURO HOME flooring is not merely attractive to the eye, but it also beautifully withstands all the pressures of everyday life. Be inspired and delight in watching your visions – and style – come to life! Take a look through our collection and get some ideas for your home.